I get so many questions about what I use to plan and organize my blog content so I'm excited to share a sneak peak into everything today! I've got a favorite planner, calendar, notebook, and even pens so let's get started. Some people can stay organized with some basic tools from the Dollar Store. Unfortunately for my wallet, I cannot. I've tried them so many times but either the lack of functionality or the poor quality will fail me. I'm busy so I need a lot of small planning details in my planners. I'm also very hard on my planning tools now that I have a toddler. I need items that can withstand a year's worth of animal crackers and trips to the park! Watch the video version of this post up above (don't forget to subscribe!) OR scroll down for the text version. This post contains affiliate links but girl, I don't recommend stuff I don't love! You can read my Disclaimer for more info. It's no secret that I'm a big fan of the Erin Condren LifePlanner, after I did a haul here and a cheap alternative stickers haul here. I use this planner to create my content calendar in the monthly view portion and then get more detailed with day to day tasks in the vertical, weekly view. I sometimes separate portions of each day by YouTube, Blog, and To-Do tasks but they usually start to blend together if I have a lot to accomplish! Psssst...get $10 off your first order by using my special link and joining their email list! This particular type of Moleskin is great for me because 1) I'm a sloppy writer and 2) I like to use diagrams and bubbles to define my strategies and product launches. I go through A LOT of these but they're relatively cheap so it's no big deal on my wallet. And I'm a total hoarder. I have strategies written from my very first product launch still saved so sometimes it's great to go through old Moleskins and see how I've progressed. These calendars are really great because I'm such a visual, snapshot planner. I like to see weeks in advance all at once to get a real feel of exactly how busy I'm about to be! I keep these calendars exclusively for my launches and re-launches. I just don't want them getting mixed up in my regular planner because there is usually so much to get done that I have the tendency to lose track of my progress! This particular item may not make sense for a lot of you guys and that's totally cool! But I have a young toddler at home and in 2016, I made it my mission to make sure he didn't see me on an electronic device much throughout the day. Yeah, you read that right. I wake up super early and work on a computer and (obviously) use my smartphone throughout the day. But as a whole, he probably sees my face in front of a screen for a total of 1-2 hours/day. That may be a little or a lot for some of you but that's a significant decrease from what it used to be for me. I used to do all of my client work throughout the day while he would play next to me. He wasn't even on an electronic device but it bothered me so much that he saw his Mama on one. I use these legal pads to outline what I want to say in blog posts or videos so that when I wake up early, I can just quickly type things up. It's a bit redundant because I'm taking an extra step but I'm much happier with our new normal of very little computer time throughout the day. You guys might find this one so silly but I need good pens to really keep things looking neat in my planner! It's no secret around here that my handwriting isn't the best. Sometimes I'll read my planner and not know what I meant to write. These pens have the finest tip and a smooth glide. They also have some sentimental value because my grandmother used them for as long as I can remember. After she passed away, they became something special to add to my daily work life. It's a HUGE bonus that they work beautifully! What are your favorite products to plan with? 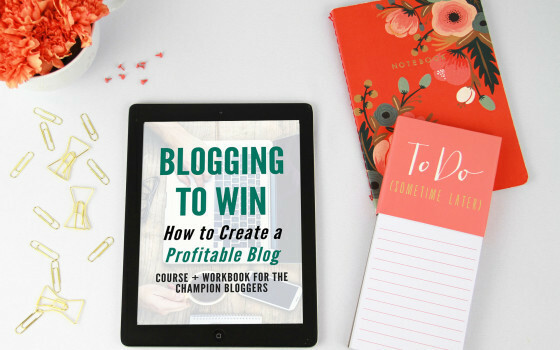 JOIN MY FREE 7-DAY BLOGGING COURSE! This course comes with a totally awesome 29-page workbook that'll help you build a mastermind plan, keep track of your goals, and more.